These children lost one or both of their parents to the devastating earthquake and tsunami that struck northeastern Japan on March 11. 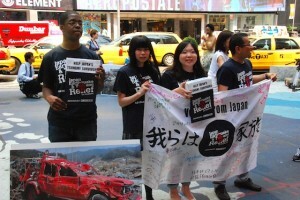 They were in New York last week on behalf of the Japanese non-profit organization Ashinaga, which is raising money for the construction of a day care center for the roughly 1,200 children who lost at least one parent in the tragedy. Morgan Stanley partnered with Ashinaga to bring the four teenagers – Shoya Kasai, Maria Kusaka, Sayaka Sugawara, and Manami Tanno – to New York last week for the fundraiser and other activities. 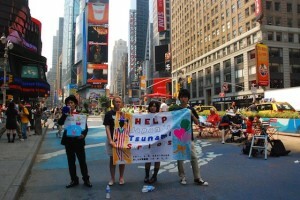 The children also visited Ground Zero, met students at a local high school, and attended a benefit concert for Japan. Morgan Stanley has been involved with Ashinaga since 2005, and in the past six years employees have given a total of 57 million yen ($709 thousand). “[Ashinaga] is actually one of the most significant recipients of our employees’ generosity,” says Joan Steinberg, Global Head of Philanthropy and President of Morgan Stanley Foundation, as she opened the fundraiser’s press conference held at Morgan Stanley’s head office in Times Square. Ashinaga is based in Tokyo and has been providing financial and emotional support to children who have lost one or both parents to illness, disaster, or suicide for more than 40 years. 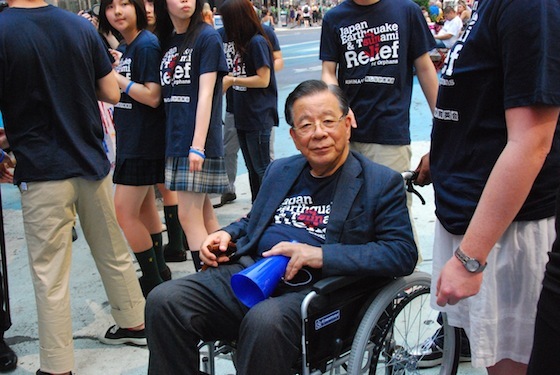 Yoshiomi Tamai established the Association for Traffic Orphans after his mother was killed in a traffic accident in 1964. Tamai then expanded the reach of the program to include children who lost parents to illness after his beloved wife died of cancer. By 1993 the program was re-named Ashinaga and evolved into what it is today. While not an orphanage, Ashinaga is committed to the psychosocial care of orphans by offering them a place to share their experiences with other children in similar situations. After the Kobe earthquake of 1995, Ashinaga built its first such center, called the Kobe Rainbow House, which opened in 1999. When the disastrous earthquake and tsunami destroyed Japan’s northeastern coast three months ago, Tamai announced Ashinaga’s goal to build a Rainbow House in Sendai. Building the Tohoku Rainbow House requires Ashinaga to raise approximately $37.5 million, according to Yukichi Okazaki, who serves on Ashinaga’s board of directors and was named the non-profit’s Japan Earthquake Operations Center Chief after the March 11 disaster. Okazaki, who lost his father at the age of two and received educational support from Ashinaga, says he and his colleagues were in New York to place a global emphasis on Japan’s current crisis. The four teenagers who accompanied Ashinaga to New York hid those scars with an impressive show of strength and composure. At the press conference, they each addressed the crowd in English, saying a few words about their unfortunate situations. “I have lost my mother, my father, and my older sister. 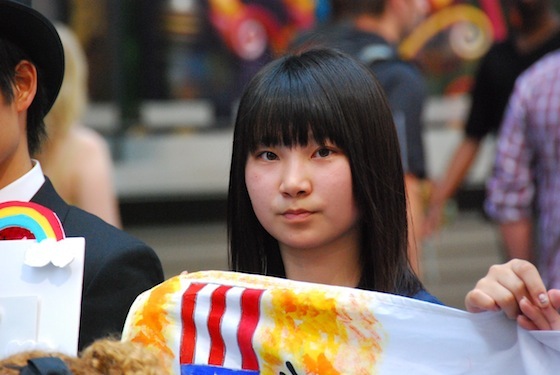 Everyone in my family,” says the oldest of the four, 18-year-old Manami Tanno of Sendai. Perhaps Ashinaga will help make Kasai’s aspiration a reality. The phrase “ashinaga” means “long legs” in Japanese, and the organization was named after American writer Jean Webster’s 1912 novel Daddy-Long-Legs, which tells the story of Jerusha Abbott, an orphan who sends monthly letters to the anonymous trustee – whom she dubbed “Daddy-Long-Legs” – who paid for her college education. Ashinaga president Tamai is a “Daddy-Long-Legs” of sorts: Through his foundation, he has helped more than 80,000 children continue their education. Ashinaga’s reach extends beyond the Japanese archipelago. 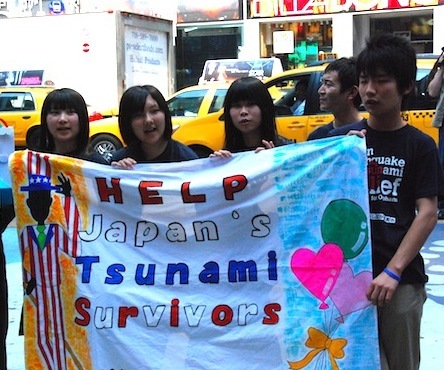 The organization sent donations to and shared knowledge with countries such as Turkey, Iran, and India after earthquakes struck there, and through Ashinaga, Nakano visited Haiti to meet earthquake victims. In 2002 Ashinaga established the Uganda Rainbow House to support children whose parents died of HIV/AIDS. The non-profit has also brought together orphans from around the world at Ashinaga-sponsored summer camps in Japan. 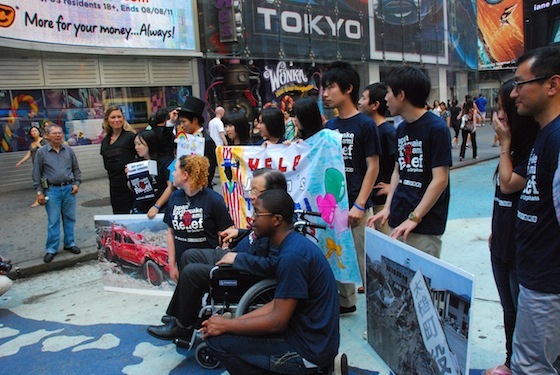 Two of the camps’ American attendees were present for the group’s activities in New York City last week. New Orleans native Wilborn Nobles, 19, lost his mother when she drowned in the floodwaters of Hurricane Katrina. Ashinaga invited him to attend two international summer camps for orphans. Nobles is a freshman at Centenary College in Louisiana, where he is studying journalism. “I truly believe that Ashinaga cares about these children, and I also believe that the support from Ashinaga will allow these children and others to receive a greater future,” he says. Twenty-one-year-old Hilary Strauch, a junior at Vassar, lost her father in the September 11 terrorist attacks on the World Trade Center. Like Nobles, Strauch attended two Ashinaga-sponsored summer camps in Japan, where she befriended other children in her situation. “Children who had experienced losses from all over the world came together for a few weeks in the summer, and we were all able to share our experiences – what was similar, what was different – in addition to having a fun, summer camp type of experience,” she says.